I’ve been meaning to work in my garden for over a week-I need to plant my onions and spinach, plus set out my irrigation and trellis. It’s not that I’m lazy, but it’s been COLD outside! It seems like it snows every other week, and I don’t want to lose all my hard work. And honestly, I hate the cold. Fortunately, Monday was a beautiful day and I was able to get out and get it done! Here are the onion sets I planted. 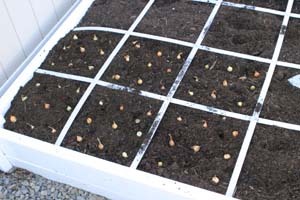 I put 9 in each square foot, and I still had a ton on little onions left. I think I’ll give them to a friend! For some reason I get scatterbrained when I plant, so I set these all out, then pushed each one into the soil, smoothed it out and watered well. I also planted spinach. In his book, Mel recommends planting 9 per square, but the package suggested spacing them 1″ apart. 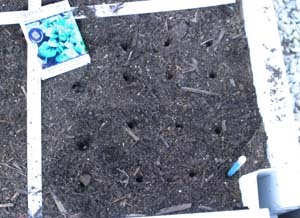 I poked all my holes first, then planted two seeds in each hole. 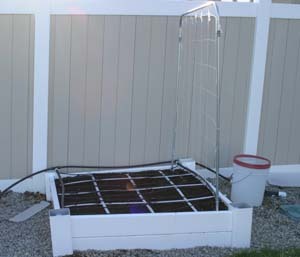 Last but not least, I set up my trellis and irrigation. Last year I had the trellis against the fence, but that makes it difficult to train the plants up the trellis and to harvest. So this year I turned them the other way. Where did you get your trellis from? Did you buyi it or make it? I purchased mine. I’m sure they’re not hard to build, it probably just requires the right tools. The aluminum pipe is really cheap, but you’d need to cut it, bend it, and have pieces to connect it. I always put my trellis on the north side so it doesn’t shade the other plants. Now, if you’re planting summer crops (tomatoes or cukes, or even melons) and wanted some shade to help cooler-weather plants (lettuce), you could plant them on the south side. Just wondering if it matters what side you place the trellis on in relation to the sun? My mother-in-law also sows her onion sets that close and then thins the ones in the middle to use as green onions and then lets the others grow into large onions. Thanks for all your help. I’m interested in reading about your irrigation system since we’ll be out-of-town alot this summer.